This well made docudramentary revolves around one of the world's most influential scientists, Sir Charles Darwin who is once again brought to life in this two part series. Even though some of what Darwin theorised has been debunked by modern scientists, his basis is still the founding element of biology as we know it today. Not only was Darwin a scientist but he was also an explorer and travelled the world for 5-years as he encountered a whole new world of plants and animals that challenged the very foundation of science. 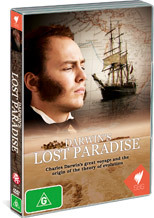 The documentary is an insight into the life of Charles Darwin and although it focuses on his understanding and challenges to the world of Christianity in terms of evolution, it is also quite amazing that this man was only 22-years of age when he started his voyage to the new world. The documentary also links Darwin to modern science and how given what was known then, how he developed his intricate theories that would change the world of biology as we know it. It's quite an insightful documentary that works on many levels and even though it may feel like a genre documentary, it can be watched and enjoyed by most viewers and you don't need a university degree to enjoy it!